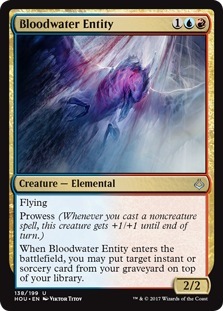 When Bloodwater Entity enters the battlefield, you may put target instant or sorcery card from your graveyard on top of your library. Put a -1/-1 counter on target creature. 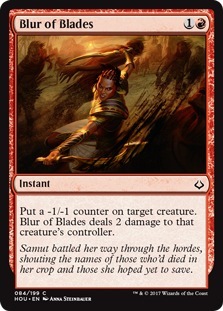 Blur of Blades deals 2 damage to that creature's controller. Samut battled her way through the hordes, shouting the names of those who'd died in her crop and those she hoped yet to save. Destroy all creatures. Lands you control don't untap during your next untap step. To the last, Bontu wanted only to be first among the God-Pharaoh's subjects. Life will find a way, or it will make one. 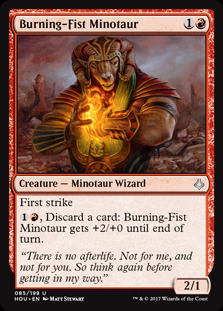 , Discard a card: Burning-Fist Minotaur gets +2/+0 until end of turn. "There is no afterlife. Not for me, and not for you. So think again before getting in my way." The banished have come home to roost. 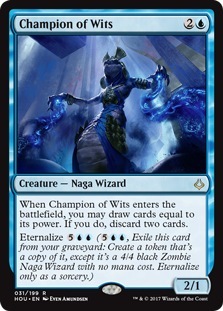 When Champion of Wits enters the battlefield, you may draw cards equal to its power. If you do, discard two cards. Discard any number of cards, then draw that many cards. 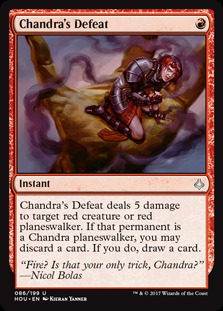 Chandra's Defeat deals 5 damage to target red creature or red planeswalker. If that permanent is a Chandra planeswalker, you may discard a card. If you do, draw a card. "Fire? Is that your only trick, Chandra?" 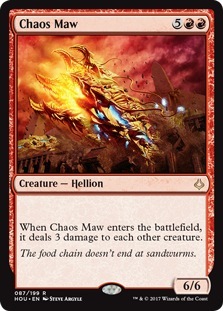 When Chaos Maw enters the battlefield, it deals 3 damage to each other creature. The food chain doesn't end at sandwurms. 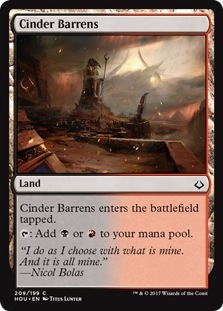 Cinder Barrens enters the battlefield tapped. "I do as I choose with what is mine. And it is all mine." Return target creature card with converted mana cost 2 or less from your graveyard to the battlefield. Return target nonland permanent to its owner's hand. 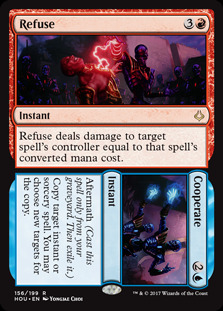 Counter target spell unless its controller pays for each card in your graveyard. The Eternals had long since mastered every technique taught during the trials. 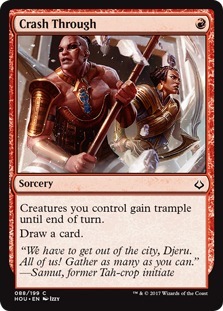 "We have to get out of the city, Djeru. All of us! Gather as many as you can." Other Horses you control have indestructible. 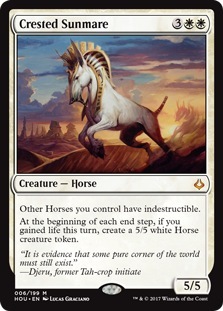 At the beginning of each end step, if you gained life this turn, create a 5/5 white Horse creature token. "It is evidence that some pure corner of the world must still exist." 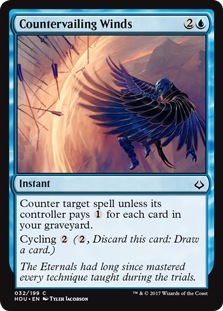 , : Exile target card from a graveyard. , Exile Crook of Condemnation: Exile all cards from all graveyards. The God-Pharaoh's angels stripped former initiates of their cartouches and the fortifying magic they provided. 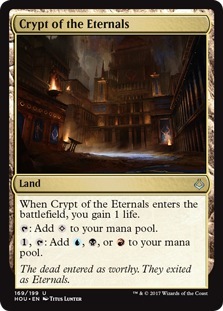 When Crypt of the Eternals enters the battlefield, you gain 1 life. , : Add , , or . The dead entered as worthy. They exited as Eternals. 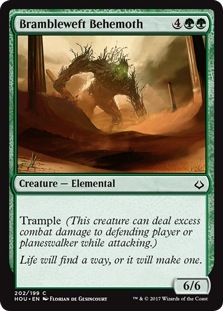 Whenever you cycle or discard a card, Cunning Survivor gets +1/+0 until end of turn and can't be blocked this turn. Initiates who had been through the Trial of Knowledge learned to see everything as pieces of a larger puzzle.